What are the consequences of information and communications technology on business? The latest global Business and Information Technologies survey focusing on New Zealand has some answers. The Business and Information Technologies project is a consortium of international units led by a research group at the University of California in Los Angeles. The project tracks the impact of information technologies on business practices globally through a commonly administered survey. In addition to enabling comparisons about the deployment and impact of IT on a global basis, the survey also tracks changes in such activity over time. New Zealand participated for the first time this year, through the Centre of Digital Enterprise (CODE) at the University of Auckland Business School, providing a local insight into the use of IT in organisations. The survey covers technology adoption, transformations in the internal organisation of firms, market facing activity, management of partner relationships and business results arising out of the deployment of IT. The topic resonated among New Zealand CIOs, as more than 100 ICT executives from across industries throughout the country participated in the survey. Damian Swaffield, general manager of technology, TVNZ, says business information technology has been an enabler for the key plank of TVNZ’s corporate strategy. The University of Auckland’s CODE, in collaboration with CIO New Zealand, conducted the survey over three months. The respondents covered a range of industry sectors and organisations of different size, with the diversity of responding organisations shown below. As such, the survey covered a range of organisations in terms of size and a broad cross-section of industry affiliations. In all cases, CODE ensured the person responding to the survey was well versed about the deployment of IT in their organisation. The three most widely deployed technologies are the use of websites and associated e-commerce, storage area networks and network-attached storage, along with wireless networking technologies. The three least-deployed technologies are Radio Frequency Identification (RFID), biometrics and enterprise instant messaging. 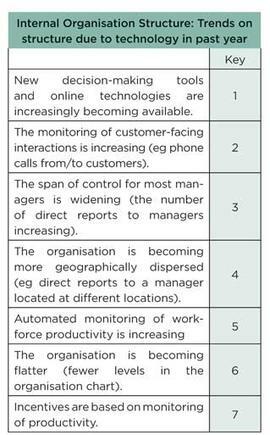 These technologies also rank as fairly new in terms of organisations that have deployed them (less than two years). A substantial percentage of organisations indicated that these technologies are not applicable in their situation. 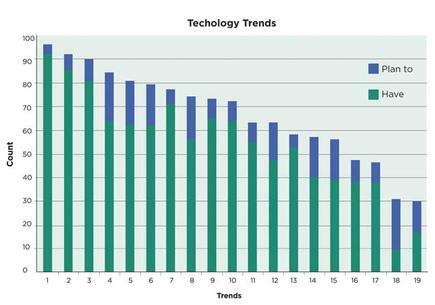 Interestingly, the use of supply-chain technologies also ranks low in terms of deployment. Other technologies fairly new in terms of deployment are collaboration tools, business intelligence and business process modelling.On the other hand, the survey shows ERP-systems, websites and groupware-tools have been in use for more than 10 years. In terms of future planning organisations are focused on investments in RFID, collaboration tools, business intelligence and enterprise application integration solutions. As well, budgets for storage hardware, software applications and disaster recovery have increased over the past three years. There were moderate or neutral trends for security, application service provision and service contracting. Survey respondents, unsurprisingly, said there is a general rise in demand for IT and collaboration across all organisations. As well, results show IT provides increased control for managers and allows better monitoring of customer facing interactions. Outsourcing is not a significant trend in many organisations, with routine functions such as accounting, finance and customer contact largely done in-house. The small amount of outsourcing that does occur is in the areas of programming and market research. While organisations are using multiple ways of maintaining contact with customers, the most popular methods are still face to face contact, the company website, phone and email. At present the least-used methods are computer telephone integration, online intermediaries and screen pop-ups. Customer analysis is mainly done through data warehousing, proactive information gathering and demand forecasting. The survey did reveal that a fair number of organisations use statistical data mining and trend discovery technologies. The least-used methods include neural network analysis and text mining. About a fifth of the organisations do not conduct any systematic customer data analysis, indicating a significant lost opportunity. Customer segmentation is largely done geographically and through the use of customer portals. However, techniques such as allowing customers to personalise the website and automated cross selling are rarely used. Automation of the CRM functions is carried out largely by the use of Help Desk and Content management technologies survey respondents reported. While respondents said the least-used methods are the use of a complaints management system or through the use of ERP or SCM technologies. E-payment, web-enabled communication and EDI technologies are the most widely used technologies among trading partners. These are also the technologies organisations indicated that are already in use or they are adopting them shortly. As well, the most widely adopted business to business mechanisms are direct purchasing, long-term purchasing contracts and catalogues, respondents stated. Hubs and exchanges are the least-adopted methods for this purpose. Production costs, customer service costs and internal communication costs have decreased with the adoption of IT the survey revealed. There is an overall increase in IT related costs, but this is expected with increasing consumption of IT-related equipment and services overall. 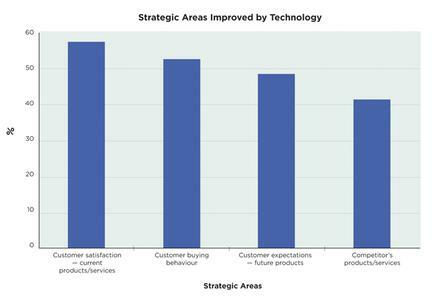 About half the organisations indicated customer buying behaviour, customer expectation and customer satisfaction were strategic areas improved by technology. Respondents to the survey reveal how deployment of customer facing technology has brought a range of benefits across the enterprise and to their external partners. Grant Casci, senior consultant, Teleconsultants, say one of the biggest benefits the company reaped through the introduction of ICT solutions is reduced customer churn and increased new business through improved customer satisfaction. Customers want organisations that are primarily easy to deal with and reliable, notes Casci. “This comes from two main ‘hits’. The first is allowing customers the ability to choose their preferred communications channel, whether that is face-to-face, phone, email, web or even SMS. The second is providing a consistency of customer experience regardless of the channel chosen. The majority of organisations surveyed indicated that revenues were generated geographically from the Australasian region. However, less than half the respondents indicated they were generated from any other region in the world, with the regions generating least revenue being Latin America and Africa. North America (including Mexico) was the most favoured location for future investment considerations. While the above section features broad observations about the survey results, here some sense of the detail and granularity of the information that was collected is presented in the form of a question and answer presentation. What technologies are organisations currently using or planning to use? More importantly, what are they not currently using? In response to this question, the survey covered a range of specific technologies and respondents indicated the status of deployment with respect to each of the technologies mentioned. The chart on page 36 provides this information for each specific technology under consideration. The table at left gives the interpretation of the codes for the trends shown in the chart. The relatively low level of deployment among the respondents of such technologies as open source (Linux), business process modelling and supply chain management technologies is noteworthy. RFID technology adoption is not happening at the moment, though forward planning about future deployment of technologies like RFID shows an awareness of its importance. How are organisations changing internally in terms of their structure due to the deployment of information technologies? In order to get a sense of this, the survey referred respondents to some specific examples of organisational change factors. The chart at right presents this information with the key showing what the trends are. While the results show new tools are being increasingly made available to decision makers, what is revealing here is the relatively low level of impact on things such as productivity monitoring and incentives and the distribution of decision-making authority in organisations. What mechanisms are used by organisations to perform customer segmentation to better understand needs of customers? Traditionally this would help an organisation better target customers for specific products and services. The top chart on page 38 captures this information. While a substantial percentage of organisations revealed using geography and portals as the preferred tools for customer segmentation, the use of internet access patterns and the personalisation of websites, both of which are widely available as tools for analysis, do not seem to be adopted as much. What are the strategic areas of the organisation that have shown improvement due to the deployment of information technologies? The chart below presents information with reference to specific strategic areas in an organisation. Understanding customers in terms of their satisfaction with products or services and their buying behaviours, are indicated as areas of improvement by a majority of the respondents. However, only about 40 per cent of the respondents indicated that IT provided a better understanding of competitors’ products and services. Mainfreight CIO Kevin Drinkwater says deployment of ICT allowed the company to meet the customers’ “insatiable appetite for information on the progress of their goods throughout the supply chain. 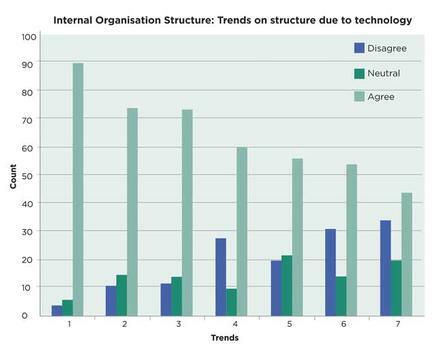 The survey provided a critical snapshot of the recent use of IT in organisations in New Zealand and provided some indication of upcoming trends. As part of a global study, this data will provide important input that will contrast the adoption of IT in New Zealand vis a vis other parts of the world. 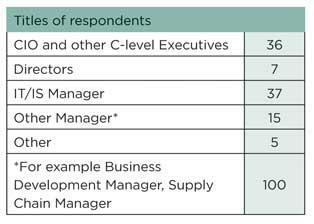 In covering a broad cross-section of New Zealand organisations, the survey provides a picture of what is happening in multiple industry sectors as opposed to looking at a single, technology-oriented sector. 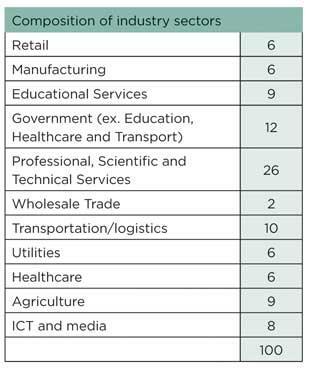 Specific industry sector information will vary from segment to segment, though the survey aimed to get a national level perspective on IT deployment. The authors are co-directors of CODE, The Centre of Digital Enterprise, a research centre at the Auckland University Business School. CODE studies the adoption of information and communication technologies and how these are transforming individual organisations, national and transnational economies and emerging business models. They were assisted in this research by Helen Lacey, CODE administrator; Christoph Breidbach, PhD student and Jesse Candy, postgraduate student.